Kids can look charming and cuter by considering little changes in their wardrobe. There is a lot of creativity in children’s wardrobe. Have fun in dressing your kids in hottest trends of this year. Kids are the most beautiful and cutest creature of Almighty Allah. Kids are also very conscious about fashion and style and want to look more beautiful than others. It’s not a secret that kid’s fashion is often a reflection of trends for grownups. Kids have their own styles. A wide range of fashionable collections for kids is available in market. Designers are also busy in introducing new styles and fashion collection for kids. This year kids clothing ranges from traditional dresses to modern and funky stylish dresses. Kids are not less than others in fashion. They like to imitate their parents in everything including clothing as they consider their parents a role model for them. Mothers who are looking for fashionable cuts and colors for kids must check out this guideline which I have formulated for you. Kids can be look cuter by mixing up their outfits without having to purchase completely different wardrobe. 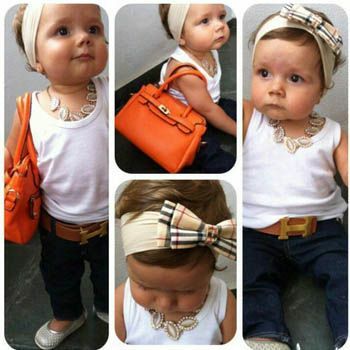 Add some accessories in outfit of kids and they will have complete new look. The more interesting thing to be notice is that kids are also flocked through runways this year. This year, it is all about vintage prints, floral and French nautical and modern graphics with cool retro shapes. Bright colors like yellow, red, orange, blue, navy, grays, and popular neon’s are in vogue this year. These dresses are perfect for casual and party wear. For girls, a beautiful floral top with a pair of legging is in trend. For more stylish look, kids must try panama straw hat. For girls, there is nothing best than floral prints and designs. Many designers have introduced a line of fashion with lots of fringe, chiffon, satin and lacy items in general. Floral prints and designs are everywhere including pants, jackets, tops, legging, frocks, skirts and even jumpsuits. For trendiest look try to mix and match colors. Most pieces with long ribbons, ties, floral themes, layered patterns are all rave this season. Kids usually look cuter in bright and colorful dresses but f you are looking for something decent then use basic whites or cream with primary colors of compliments and a classical clean feel. This year bright blue greens and pinks are in vogue in dresses. Besides these fashion collection t-shirts sleeveless loafers and sandals are also popular. Mixing and matching the colors and patterns is easily executed in latest trends of kids by using the ever popular layered look. Layering is still in trend, it has always been in trend because it allows designers or colors lover to play with colors and different patterns to create a more balanced ensemble. Micro fleece is a big hit with denim jeans, skirts, pants, jumpsuits, vests, shorts and shoes. Each item is available in different styles in various fabrics and forms. To make kids more stylish, accessorize their clothing with jewelry, colorful ribbons, ties, belts and hats. Let them enjoy their beautiful childhood by playing with colors. Make sure to capture beautiful looks of your kid in camera. JENNIFER LOPEZ AND DREA DE MATTEO: THE NEW CAGNEY & LACEY?